I’ll drive a long ways for a good taco. Fortunately, I don’t have to drive far in northern California. 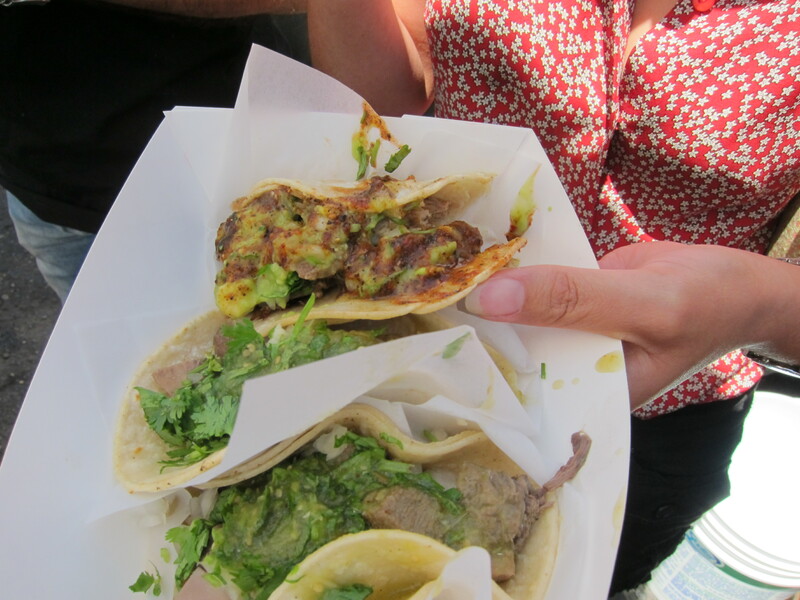 Plenty of tacquerias and taco trucks put together some very tasty samples. But a really good taco is hard to find. At the moment, I’m in the frustrating position of having found a tacqueria that has mastered the meat but not the sauce and another tacqueria that has really good sauce but only adequate meat. 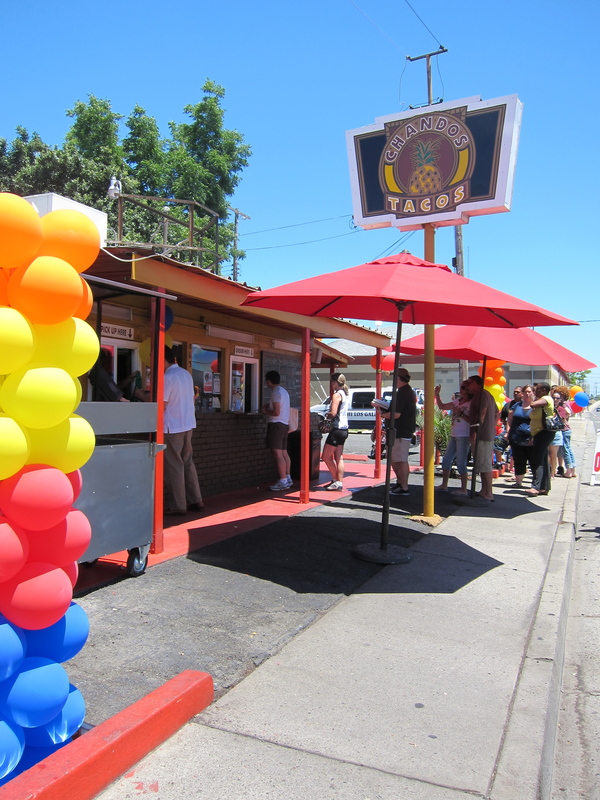 A little taco-matchmaking is called for. 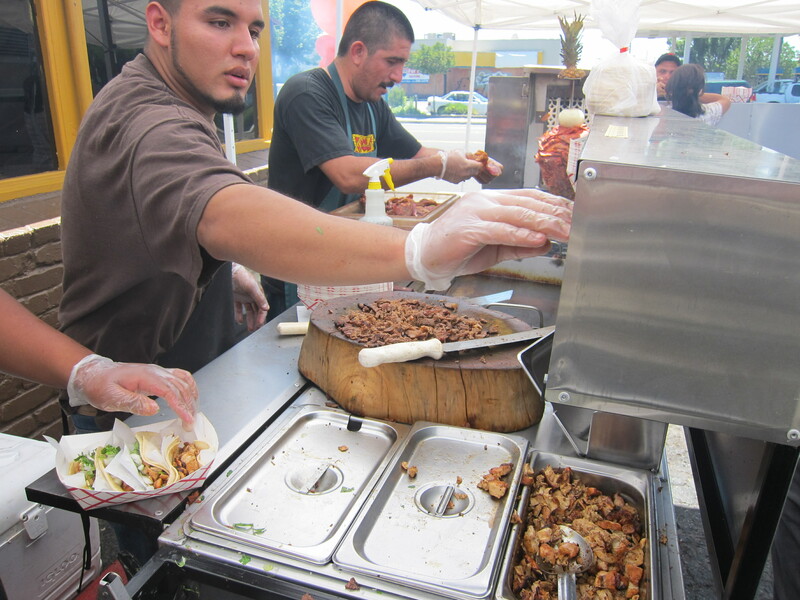 Chandos Tacos, owned and operated by the Madrigal family under the leadership of young Chandos Madrigal, really knows how to grill meat. They threw themselves a richly deserved first birthday party this weekend. I went with some friends to sample the $1 tacos (usually $1.75). We found a big crowd of other tacquistas already in line. To my everlasting shame, I ate seven tacos: 1 carnitas, 1 birria, 1 carne asada, 1 adobado, 1 tongue, and 2 fish tacos. The meat in all of them were what they should have been: crispy carnitas, tender tongue, smoky birria. My favorite, however, was the fish and the carnitas. My two reservations are the sauce they make and use and the seasoning. The sauce could be hotter; the meat could be better seasoned. Just a tad more salt, Chandos, please. Would you consult with whoever it is at La Favorita on Florin who makes the salsas? Other than those nitpicks, I love the tacos here.